Medserv’s commitment to contribute to the communities the company lives and operate in is reinforced year on year. Medserv believes in providing for and supporting stakeholders, being our people, our shareholders and the local community. At Medserv we renew our commitment to contribute to the communities in which we operate each year. The Company’s CSR agenda is aimed at being active in local society in a movement towards responsible business practices that create positive change. The following are the concrete ways in which Medserv has supported the community over the last year. Medserv employees enthusiastically participated in a Football Marathon in aid of Puttinu Cares last May. 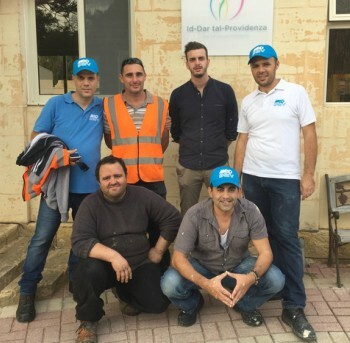 In November employees from the HR, shipping, yard operations and client support departments came together to carry out some maintenance work and set up the Christmas decorations at Id-Dar tal-Providenza. The Company also donated funds to ALS Malta, Happy Paws, to Henry Mamo – a child suffering from a rare condition called Prune Belly Syndrome, and continued its support to Fondazzjoni Patrimonju Malta, an organisation set up with the aim of spreading Malta’s extensive heritage locally and internationally. In our efforts to continually improve our work environment, in October 2016, a Group subsidiary obtained the Equality Mark Certification awarded by the National Commission for the Promotion of Equality (NCPE) for a period of two years. This certification is based on evidence of a true commitment by Medserv Operations Limited to implement relevant policies and practices that concern gender equality and family friendly measures at the place of work and in the access to and provision of goods and services. One of the Group’s subsidiaries also obtained the Certificate of Environmental Management issued by Bureau Veritas dated 11th October 2016, as recognition and evidence of the conformity of the Medserv Environmental Management System according to the standard ISO 14001:2004. This is an international standard of environmental management that demonstrates the commitment of the Group towards the sustainability and the protection of the environment. ISO 14001 promotes the protection of the environment and the prevention of pollution by the recycling of waste, lower consumption of water, awareness campaigns amongst employees, reduction of the expenditure on energy and a strategy for sustainable transport. This award demonstrates the effort of the Medserv team when it comes to the protection of the environment and the preservation of natural resources. At year end, the Group’s solar farm was fast approaching a milestone figure of 5 million kg of CO2 emissions saved. The system has produced over 7,597,900 kWh of energy. Medserv has also teamed up with the University of Malta acting as their industrial partner on Project FLASC (Floating Liquid-piston Accumulator using Seawater under Compression). This will involve the design and construction of a scaled, proof of concept prototype. Medserv will provide engineering experience in fabricating, sub-sea deployment and logistical support to the University of Malta through its Malta base. Medserv is also contributing financially to the project to the sum of €16,890 over a period of 3 years. In the UAE, METS have supported a number of sporting activities and events that bring the team together with their customers and their families.